IBPS RRB VI Pre Exam Result 2017 IBPS RRB VI Admit Card 2017 - IBPS Officer Scale –I II III Assistant Call Letter 2017 - IBPS RRB VI Officer Scale –I, II, III and Assistant Recruitment 2017- IBPS CRP Officer Scale –I, II, III and Assistant Recruitment 2017 – www.ibps.in. The exam has been scheduled from 25th to 26th November 2017. 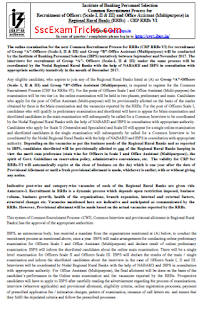 IBPS RRB has uploaded admit card for the examination on official website for the posts of Office Assistant. The good news is that IBPS RRB Mains Exam Admit Cards for Officer Scale I & II have uploaded on official website. These admit cards will be available up to 05th November 2017 on www.ibps.in. Those candidates who have qualified for mains exam can download it from the link given here. Latest News (21.07.2017) - The online link will be activated on 24th July 2017 for IBPS RRB Officers & Office Assistant Recruitment 2017. Latest news (20.07.2017) - The online link for applying online is still not activated on the official website www.ibps.in. The online apply link will be activated soon. Today, RRB has uploaded the notice relevant to the starting and closing of IBPSC RRB VI online recruitment 2017-18 process. 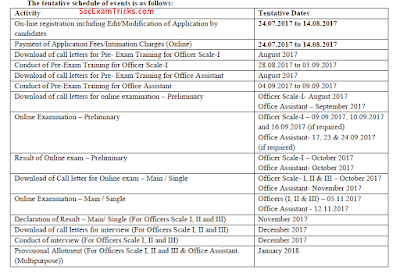 Institute of Banking Personnel Selection (IBPS) had released notification and invited applications from 20th July to 01st August 2017 for 15091 posts of Officer Scale –I, II, III and Assistant Many candidates are ready to apply for this recruitment and many others have submitted their online application forms on the official website. The process for downloading IBPS RRB Office Assistant (Multipurpose) scorecard/ marks list of candidates are also mentioned on the official website. The notification for main points is given and download from here. 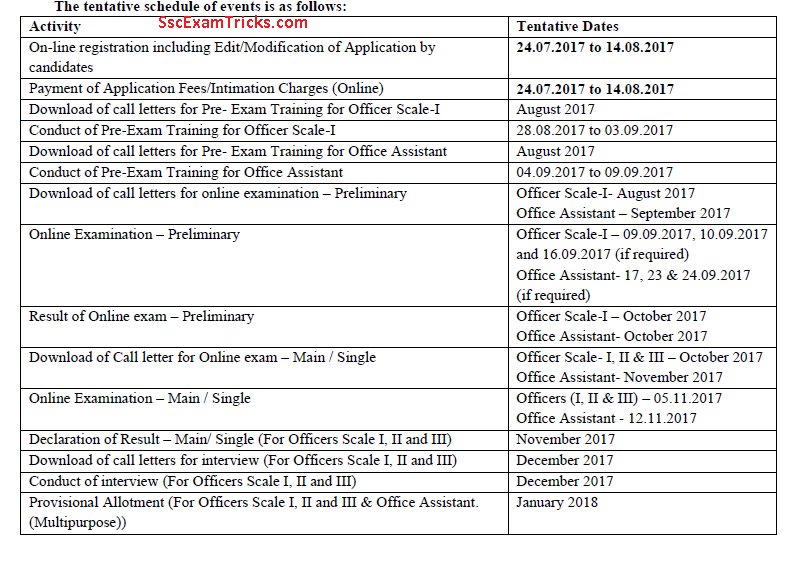 The main exam for IBPS RRB Office Assistant will be held on 12th November 2017. The online admit card for the main exam will be available about a week before the date of examination. IBPS has clarified in the notice that "Ration Card" will be accepted as a valid Identity proof for the mains examination of IBPS RRB. Biomatric refusal of the candidates will lead to the cancellation of the candidature. The marks obtained in the main examination will be considered to prepare the final merit list of IBPS RRB Office Assistant. The good news is that IBPS has declared the result as well as the scorecard of Office Assistant Pre-Examination held on various date of September 2017. The scorecard/ marks along with the result can be downloaded from the link given here. The result has been declared now and the successful candidates are looking for IBPS RRB Mains Exams Dates. The mains exam will be organized on 12th November 2017 for successful candidates. The online admit card for IBPS RRB Mains Exam 2017 will be available about 15 days before the date of exam. This can be predicted that IBPS will upload IBPS RRB VI Mains Admit card on 25th - 28th October 2017 at www.ibps.in. The news is that IBPS has released online admit card for Officer Scale I & Office Assistant exams. 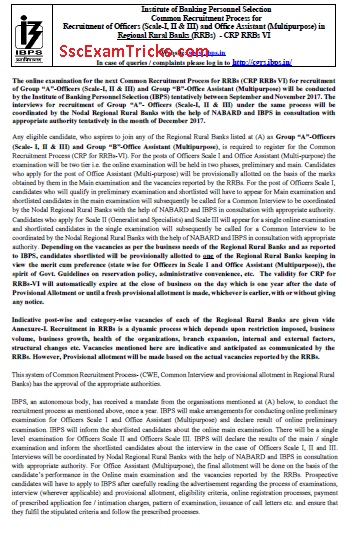 The good news is that IBPS has uploaded RRB VI call letter on official website. The candidates are required to login their account for downloading these admit cards. The Admit card is a mandatory paper act as entry card for the examination. The candidates is permissible to attend the examination with this admit card along with photo ID proof having same details (such as father name, DOB and address of the candidate) as mentioned in the admit card. · Click on application link.